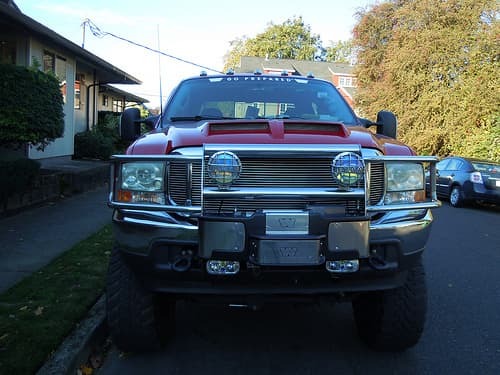 Finding the right winch for a pickup truck can be an essential step for an owner. This is especially true if you need it for a job site or backyard work project. Many owners will want to find the most reliable and cost efficient winch that they can find for their pickup truck. But they will also want to consider a few other factors as well. Feel free to read through this guide to get a good idea of what kinds of qualities you should look for in a winch. Just remember to get a great all around model that doesn’t scrimp on any of its details. This is a tough winch that will provide tons of pulling power for the pickup owner. It can pull 12,000 pounds of weight with its line, making it a very versatile piece of equipment. This is about as much as you would ever want to try to pull using just a pickup truck. The primary downside with this model is that it is very heavy, weighing in at 102 pounds. For this reason, it likely wouldn’t be a good fit for some smaller pickup trucks out there. It may be best to save this model for some of the heavy duty rigs on the site. This is a premium quality winch that provides more overall pulling power than almost any other brand you will see on the market. It is impressive, because it manages to pack all of this strength in to just an 85 pound frame. This is essential for many trucks who don’t need to be weighed down by a bulky winch body. The only downside is that it is considerably pricey. It is the most expensive model put out by the Warn company, which may be out of the price range for some buyers out there. This model can pull about 9,500 pounds at a very impressive rate. It can yank back at a speed of 5 feet per minute, which can help you get the job done much faster. It has a relatively light weight at just 65 pounds. But it is somewhat delicate, so it may be best used for small jobs.